Working at the shop full time, I get to meet such a lovely array of people. No matter their shape, size, and gender, all corset clients are there for the same reason: they want to minimize their waistlines and relish enjoyment in the support and confidence that a corset gives. As I touched on in a previous blog post, we get a lot of clients who come in looking to corset lace for medical reasons, including but not limited to posture correction for medical conditions like Scoliosis. For a little more information on medical and support corsetry, The Lingerie Addict posted a very informative blurb on the subject. What is more uncommon is to have clients who are legally blind come into the shop, eager to get laced. My experience with client Marilyn is one I will never forget. It was a brisk and clear winter afternoon when Marilyn came in through the shop door. I could not see her right away as I was just behind the counter organizing stock, but I could hear the nails of paws clacking against the wood floors. When I looked up I saw her with the most memorable smile, happy to have arrived but I could sense her curiosity; I knew right away it was her first time in the store. She was followed by her husband, who looked up in amazement at all of our corsets on display. I could tell that they were both excited to be there. Her guide dog led her around the shop at a steady pace as she took in her surroundings. Before we started talking, I knew that Marilyn was vision impaired, but that did not stop her from enjoying the space. With her sense of touch, her fingertips told her details of the textiles between her fingers, embracing the feel of satins, silks, and cotton against her skin. Her husband would narrate visual characteristics like colours and patterns that she could not discern through touch. Despite not being able to see everything in the store, she would judge a piece by the way it felt. The two of them made a great time as she explored the shop before approaching me excitedly about our corsets. Marilyn was in desperate need of a supportive corset to help her posture. One thing I noticed as she took off her coat was that she hunched forward and leaned to one side. Her Scoliosis not only affected the comfort level of standing and walking, but her confidence needed a boost. She wanted to feel beautiful and was drawn to colours that she remembered well, all while needing something supportive and comfortable. Her husband had googled “medical brace” and our store had come up. After consulting their family doctor with the idea of a corset, they decided to come to our shop first. I confirmed with them that our corsets are lined with a very firm cotton that would not leave the skin irritable or itchy, which was very important to her. All of our corsets had flat steel boning of the highest quality to ensure a supported silhouette with perfect posture. Lastly, they were relatively easy to put on and take off, and that I would show both of them how to lace and unlace a corset. 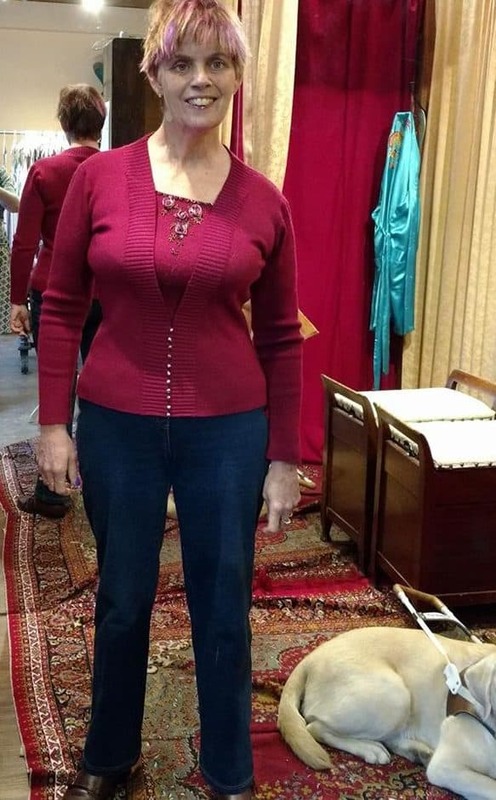 Before the fitting, I asked Marilyn if she would be putting the garment on herself or if her husband would be helping her. She quickly responded that she would ideally like to do it all herself, but that he should know in case she needed help. The idea of teaching someone who couldn’t physically see what I was doing was daunting at first, but we managed to figure it out almost immediately. We started with me explaining the process of loosening and tightening the laces, what direction to go and what laces to pull. I helped move her fingers across the back lacing panel of the Cincher corset she had chosen in black satin. Methodically, she followed my instructions to feel for the top cross laces, and we worked together to tighten the corset around her. After a few practice runs, she had no trouble doing it herself – it was her partner that needed more time to figure it out! I was amazed by her independence as well as her vivacious personality. She spent the entire time with a big grin on her face. It was definitely a very rewarding experience for all of us. Since taking home her first Lace Embrace corset, I ran into Marilyn at the shop a few months later. She was wearing her corset under her clothing, which she loves to wear out for her walks to keep herself from slouching forward. She told me she puts it on herself and that she felt amazing every time she wore it. Her husband especially loved her in it, and he commented on how much sexier she felt with her new found confidence. It was incredible to see how independent she was despite her impaired vision. With Marilyn, she didn’t treat being legally blind as a hindrance and embraced her lifestyle. She seemed so full of life and it was inspiring to me. Now that you know that a blind woman can lace her corset effortlessly, you should have no trouble doing it on your own with practice! If you need a refresher in lacing, be sure to check out this lacing tutorial collaboration video that we made with Cora Harrington of The Lingerie Addict.